Powerline Communication (PLC) is a technology that offers several advantages. It can be used to reduce harness wires (which lowers the system mass and thus reduce the overall fuel or energy consumption), to allow communication where no communication cables are possible or to add a redundant communication channel. Explinovo’s freely programmable ECU CatchTheBus is a tool that will help you integrate the PLC technology into your product. 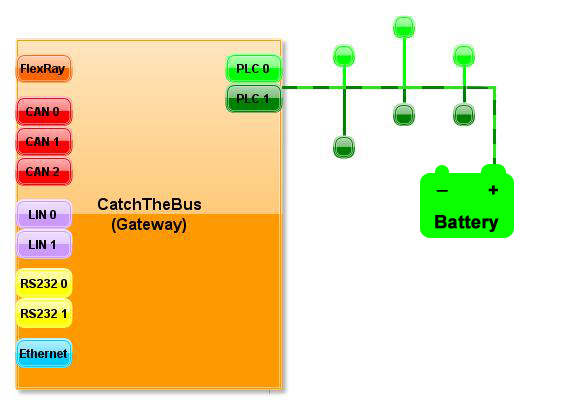 With CatchTheBus you will be able to run up to two separate PLC networks on the same battery supply. CatchTheBus will let you interface the PLC network with several different communication standards: CAN, FleRay, LIN, Ethernet and RS232. The provided libraries will let you develop all kind of complex applications very easily. CatchTheBus was being already successfully integrated as Powerline Communication-to-CAN gateway for rear lights of a truck.